Roger Manley bought his Tesla Model S about six months ago and has put quite a few miles on it since then. He and his wife and son are adding a lot more miles while touring America’s National Parks in Arizona and Utah. I’ll let Roger continue his tale. After 2,560 miles driving in the Tesla Model S, my son Brian and I are now home. We had a great trip and saw natural wonders in Arizona and Utah that everyone should plan to see one day. 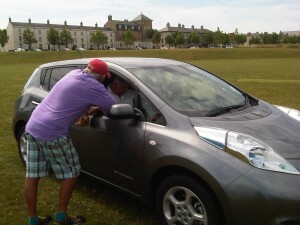 During the trip we used 787 KWh and averaged 307 wh/mi. We made 17 Tesla Supercharger stops, two charges at BLINK 25 AMP stations in Scottscale, AZ., one HPWC 100 AMP charging station at the Tesla Sales location in Scottsdale, and used two 50 AMP charging stations at RV parks in Utah. In general charging was easy and quick at the Tesla Supercharging infrastructure. 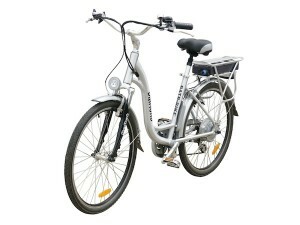 The BLINK 25 AMP stations were slow, but available, only charging at approximately 20 miles per hour. Charging at the Tesla Superchargers and HPWC is free. The BLINK chargers cost $.02 per minute and I spent about $13 total, plus $8.50 at one of the RV parks. 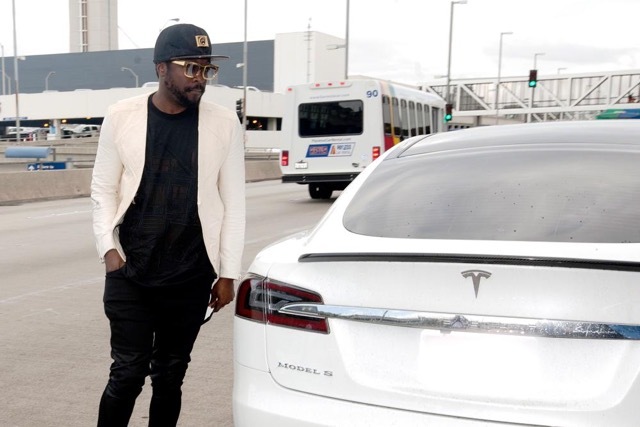 The Tesla Model S ran perfectly. The first part of the trip featured in the last post I checked the mileage at every stop to make sure I understood how the car was performing. I had printed out detailed spreadsheets from evtripplanner.com and compared actual to planned from Monterey to Scottsdale. After that I just used the navigation and trip software in the car. The last post was from Monument Valley, about 300 miles north of Phoenix on the Utah and Arizona border. After staying overnight at Goulding Lodge and RV Park we took a 3.5 hour guided tour narrated by a local Navajo an. He drove us through amazing scenery in Monument Valley, all off the main roads and completely on reservation lands. He talked about Navajo traditions and culture. 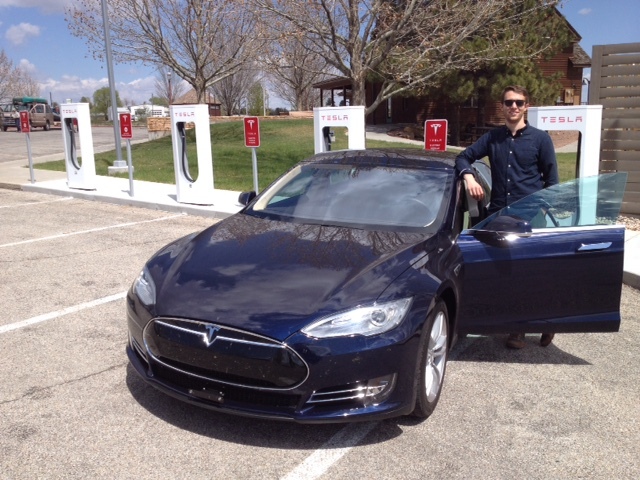 After the tour we headed to Blanding, Utah and plugged in at the Tesla Supercharger. Blanding is a small town and relatively closed up on a Sunday afternoon. We ate lunch at the local A&W and headed off to stay the next two nights in Moab, Utah. On the way I had researched a stop called “Newspaper Rock Monument” just a few miles from the south side of Canyonlands National Park. Newspaper Rock is a large rock wall with a dark patina that has petroglyphs carved in the face. It is estimated these were carved by Native Americans between 2,000 BC and 1,300 AD. An hour later we stopped in Moab at the Best Western Plus Canyonlands hotel. A Tesla Supercharger is located in the parking lot of this hotel making it an easy choice. Moab is a small vibrant town with tourists visiting many local attractions including Arches National Park and Canyonlands National Park. The next day we drove through Arches National Park making many stops and taking two different hikes. The first was to the lower viewpoint for Delicate Arch. The second at Devils Garden where we hiked to many different arches including Landscape Arch and Double O Arch. The scenery was amazing and we were tired after 10 miles of combined hiking. On the way out of Arches we stopped at Park Avenue and were blown away by the beauty of this small valley at dusk. Needless to say there is lots to see at each of the stops we made. The next day we were off to Bryce Canyon National Park. We made two Supercharger stops along the way and reached the Best Western Ruby’s Inn at the entrance to the park. The rim of this park reaches over 9,000 feet and we could feel a big difference in elevation as we hiked up to Inspiration Point at dusk. The weather was cloudy with a few rain showers, but the clouds parted and sunshine filled the valley right before sunset. The next morning we stopped at the Visitor Center. Each of the parks we visited had a theatre that shows a 20 minute film on the history and geology of the areas. We hiked down into Bryce Canyon at Fairyland Point and got a different perspective down among the “hoodoo’s”. 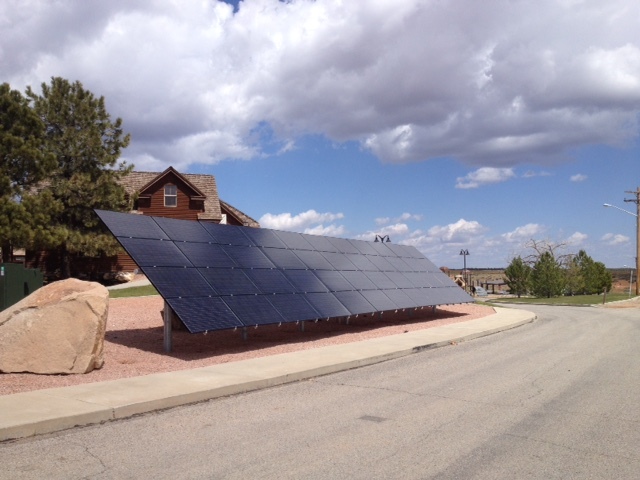 Later that afternoon we drove to Zion National Park with an elevation of 3,500 feet and only used 15 KWh over 88 miles. Zion National Park has many outstanding features, one being cars are not allowed into the park, unless you are staying at the National Park Lodge. Everyone else parks at the Visitor Center and uses a free shuttle that is very convenient. Again more hiking to Weeping Rock, The Emerald Pools, and the Riverside Walk. That night we blindly ran into two friends coming off the shuttle bus we have known for thirty years and had a nice dinner at “Wildcat Willies” in Springdale, Utah. What a surprise! The last day of our trip was Friday April, 24th. We left Zion National Park at 6am and drove 680 miles to home in Monterey. I thought it was quite a feat in an electric car given we stopped to charge in St. George, Utah; Primm, Nevada; Barstow, Mojave, and Harris Ranch in California before arriving home at 10pm. The Tesla Model S was flawless the whole trip and both my son and I agreed the miles went by faster because of the quiet, smooth ride. I decided to make this trip last September after seeing an article in Sunset Magazine about the national parks in Utah. I hadn’t taken a long road trip in the Tesla and thought this would be an excellent journey especially since I was turning 60 this year. My wife and I spent a week in Scottsdale, AZ and then my son joined me in Flagstaff, AZ for the rest of the trip. The national parks were even more than what I could have imagined, having never been to these previously, and definitely left me wanting to spend more time there in the future. 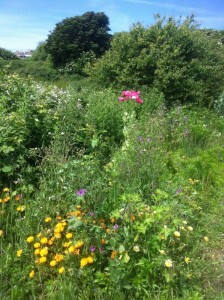 Here are two pictures. 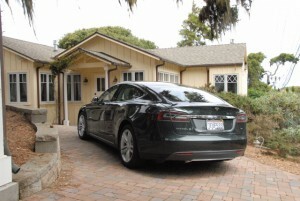 One of our Model S charging in our carport and the other of the solar panels on the roof of our house. Perhaps this will be a good starting point from which to discuss the experiences of my wife and I as well as other electric car owners. We picked up our Tesla Model S 85 on March 28th, 2014 at the Tesla factory in Fremont, California. I had ordered the car through the Tesla web site and expected the car to be completed and ready for pickup during the first week of April but it was ready a week early. When the Tesla rep called us with the good news I shocked her by telling her we’d already arranged for public transportation to get us the 110 miles from our home to Fremont for the following week and we’d rather wait than change our plans. It turns out they don’t like having cars sitting on the lot so after a bit of haggling and three calls from the rep we agreed to accept a free taxi ride to Fremont on the 28th. The Tesla dealership experience is different than any other auto dealership I’ve ever dealt with. Since every customer coming in the door has either already bought their car or desperately wants to order one there is no salesperson trying to make as much money from the deal as possible. The price is the price and that’s it. We were seated in a very nice lounge where we could examine a Model S platform. 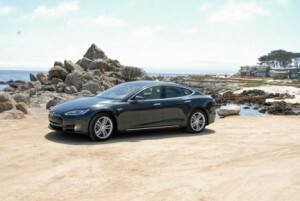 Without the body and interior there is very little to a Tesla. A watermelon sized electric motor, the axles, wheels and a 4’X 8’X 4″ (approximately) battery pack. Nice and clean, not a lot of moving parts. We had a cup of coffee and talked with the other excited soon to be new owners while waiting for our tour of the factory. The factory tour can be found on U-Tube. After a forty minute hands on session with a tech to explain how to operate our Model S we drove home to Pacific Grove, first through heavy Silicon Valley traffic and then to highways 101, 156 and 1. I was recovering from a heart operation so my wife drove. She was a bit nervous at first but the Model S put her at ease within the first few miles. It is the smoothest, most easily controlled car either one of us has ever driven. During the month before we picked up our car, we’ve named it Mr. T, I’d had a 50 amp, 240 volt circuit installed in the carport. This charges Mr. T at a rate of 30 miles per hour of charging. So the 110 miles from the factory was recharged in a little less than four hours. I programmed Mr. T to start charging at 11pm so it was charged by the next morning. We have solar panels on the roof of our house that reliably generate 15kW a day. That translates to a full charge, 85kW or 265-300 miles depending on how and where you drive, every five and a half days. Since we seldom drive more than fifty miles a day we are almost always driving on sunlight. Our electric bill, Mr. T included, was about $39.00 US for all of 2014. Although we’ve only had Mr. T for a bit less than ten months my wife and I both agree it is the best car we’ve ever owned and one of the best purchases we’ve ever made. I have some friends that own a Leaf as well as several friends that have Teslas. I’ll find out what their experiences have been and would be interested in reading the experiences of other electric car owners. 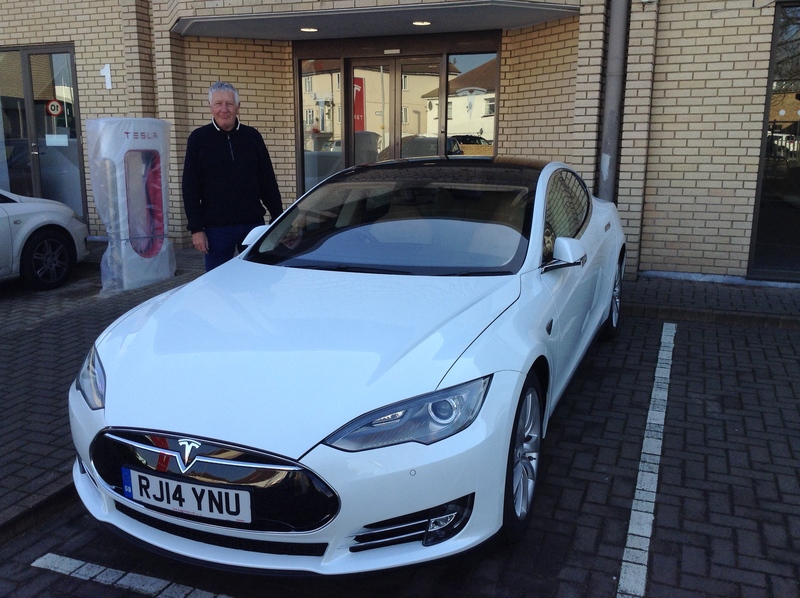 "I just talked to Tesla UK and what do you think about having the opportunity to test drive the worlds best electric car down here in Dorset. 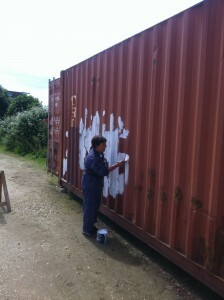 Special event for the Spring and idea’s what would make a good venue ? " 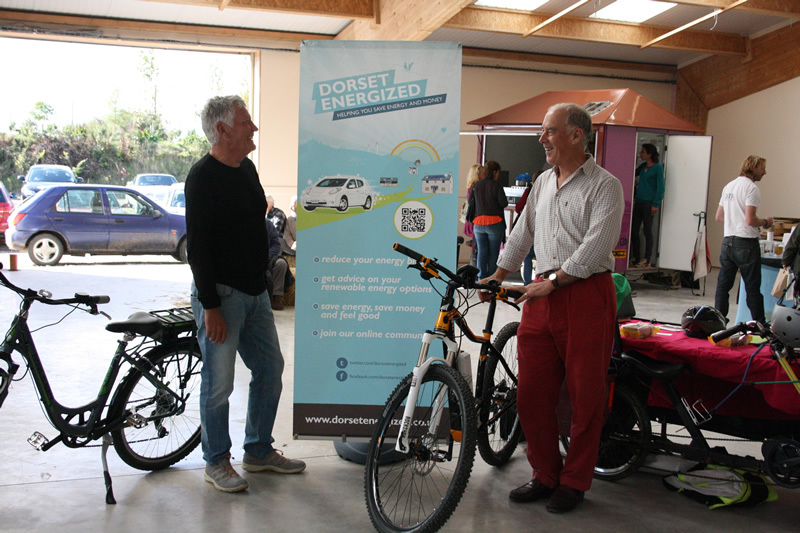 On Saturday just gone (4th October) Dorset Energized along with our friends from Cyclelife Wessex attended the Holistic Fair, organised by Primrose Matheson of Primrose`s Kitchen, at Eden Park, Buckland Newton, Dorset – and what an enjoyable, and well organised event it was. Holistic being a description of how all things are interconnected there were a wide variety of exhibitors at the Fair. People offering meditation and retreat, technology to prevent harm from electro-magnetic radiation, herbal remedies and massages, organic vegetables, scented soaps and essential oils (wonderful aroma`s from that stall), Compassion toward animals (our friends Compassionate Dorset), organic hot food, Homeopathy, organic Tea, and of course Primrose Kitchen`s naturopathic mueslis and food supplements. And not to forget Teatonics who came to the rescue with some of their lovely and remarkably restorative Yerba Mate tea when I arrived somewhat damp from the cycle ride there in the rain. Ourselves from Dorset Energized and Cyclelife Wessex were of course there to talk renewable energy and all things environmental and to demonstrate the fun and practicality of riding electric bikes. Our side of the Holistic “coin”, being that (and this is my own take on it) the Earth, this planet, also has a mind, a body and indeed a spirit – and being friends with the Earth (in all it`s aspects) is essential and actually makes you feel good as well. After all if we neglect the Earth and do not treat it as our Friend then we alienate ourselves and in practical terms endanger our own long term survival. Which of course is the whole point of Wholism and being Holistic (it`s all connected . . . .). 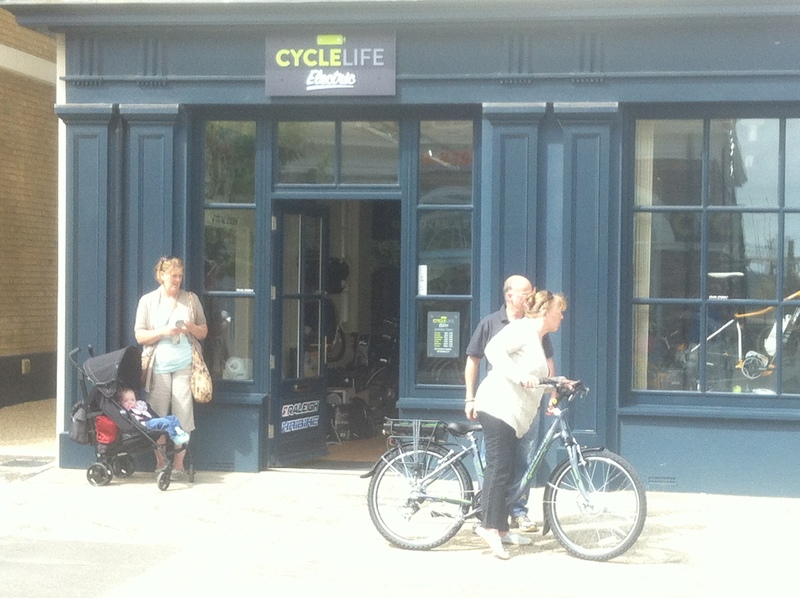 So during the day Jeremy Molger – from Cyclelife Wessex – gave a number of people the opportunity to ride an Ebike and without exception everyone who took a test ride came back full of enthusiasm – that`s the effect they have, though you have to try one to know. Indeed our very own resident Illustrator Stu Jones (who shot the photos here) took an e-bike for a test run around the beautiful rolling countryside that the new Eden Business Park is surrounded by, and said it was brilliant and that he was really surprised how well it worked and how easy it was to use and to go up hills! Meanwhile myself, Vince Adams and Keith Wheaton-Green talked a lot about Ebikes – and other things renewable, and thoroughly enjoyed ourselves and made new friends. It was a good day – and eventually the sun came out, which at the end of proceedings made my and Keith`s cycle ride to our respective homes that much more enjoyable. 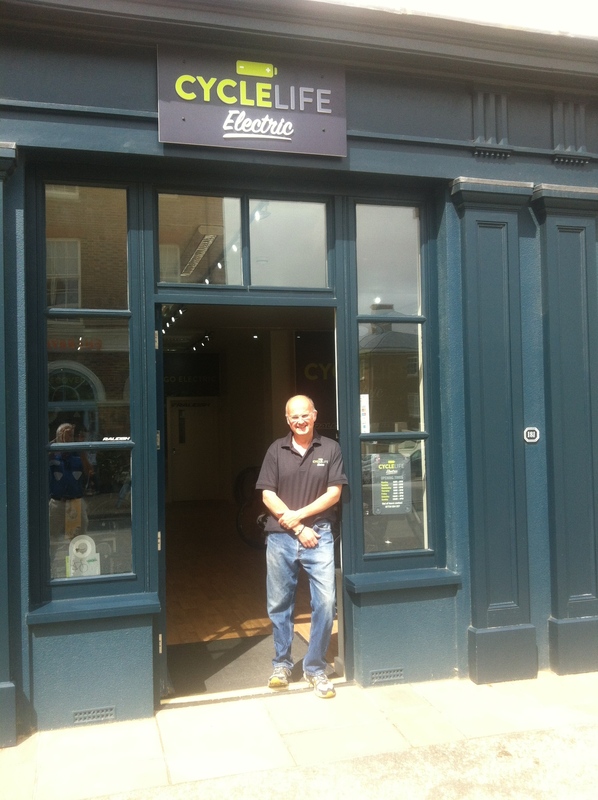 I recently wrote a piece for this Blog (Ebike Fun in the Sun) in which I mentioned people enjoying riding Electric Bicycles for the first time. 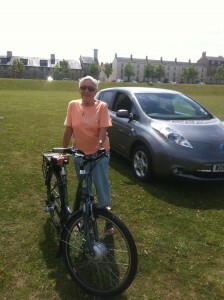 And how my own bicycle, which is fitted with a Mojo Crank Motor, proved popular with one electric bicycle first timer. Well yesterday we were contacted, via the Comments section of the Blog, by John Thraves who also has a Mojo equipped bicycle. 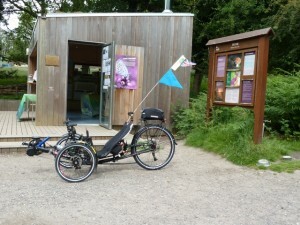 But John has his motor fitted to an ICE Trike. John it turns out is an amputee and is keen to spread the word about how Electric bicycles can assist those with such a disability to get back out on the road – an excellent project indeed, so we thought it would be great to post some of John`s photo`s and his introductory words. These trikes have helped to give me my independence, confidence since I lost the lower half of my right leg nearly 4 years ago. I was a keen cyclist before then but I found that I could not ride two wheels anymore due to the balance problem. 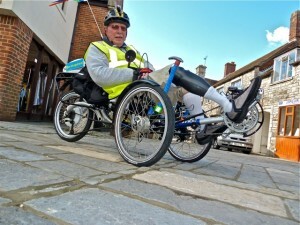 However it is worth noting that the electric assist on all of them provides me with the ability and enjoyment of managing around 30 miles in one ride with no pain or discomfort and as I have said I would like to link other amputees to the benefits of this facility. 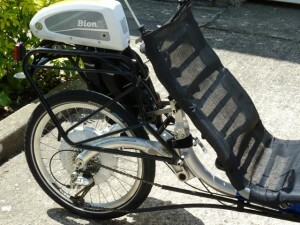 The Scorpion is the next on the list for conversion to the MOJO and I am thinking of selling the Adventure. I was walking through the Overcombe beach carpark when I saw this huge rusty container close to where another new cycle path is about to open, being renovated initially with paint to protect rusty patches. I wondered what it was and met Jacqui who told me that it was all part of a new project combining a number of Dorset small business. 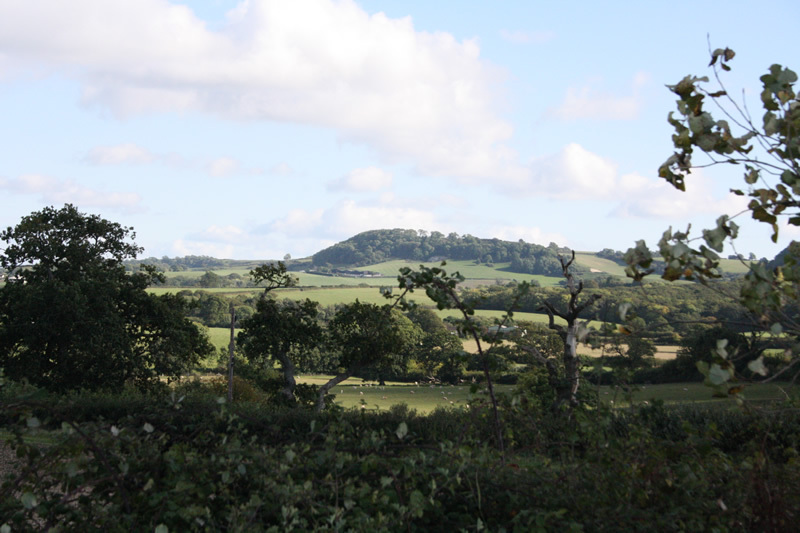 The aim is to create holiday experiences for visitors who want to get out and see the area when on holiday near and around the Weymouth/Jurrassic coastal area. 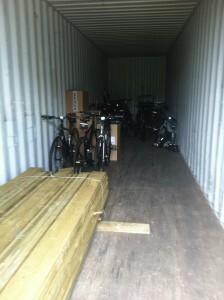 The container will be the hub for bike rental and when finished fit snugly into the surrounding Lodmoor landscape. There will be kayak rental and tour Company and one or two other Companies involved when the scheme opens later this month. Its a hell of an idea, tourism is down in the County and Jacqui believes that visitors will really respond to something different. The cycle path network will be second to none and there are a number of other ideas that could be included like electric bikes to help with the hills and even small electric cars with zero carbon emissions could be included. I went along to assist and take part – cycling from my home in Milton Abbas on my Mojo (aka Bafang/8Fun) Mid-drive motor equipped mountain bike. The ride over was accomplished in good time – the electric motor taking most of the strain out of the steep hills on the way. 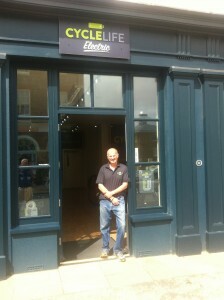 On arrival at Hazelbury Bryan I accompanied Keith as he brought down the ebike (loaned for the event by the Dorset Ebike Centre) to the Antelope Inn which was the centre of operations – and a very welcoming place it proved to be. 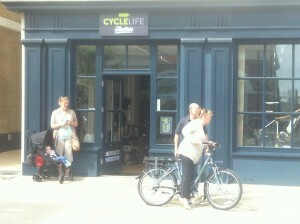 The event started slowly, but there was a lot of interest and discussion about ebikes – even my own was attracting some interest. Gradually the day began to take shape – a few people turning up to take a turn or two around the circuit on their bicycles. And I and Keith and some of those doing the cycle to Spain also began to do some circuits – Keith was using the time to put in some practice miles as were Jeremy & Luke. After doing a few circuits I asked Luke`s father, a keen motorcyclist, if he`d like to try out my electric mountain bike (I`d been describing how it was converted to electric and he had become interested). 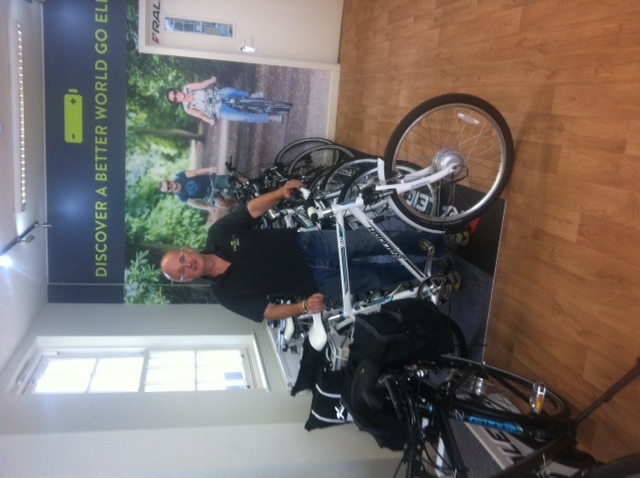 Well he took up the offer and came back from the ride with the “ebike smile” – they have that effect. As the day progressed every now and then I`d notice my bike wasn`t there – and it was out being ridden by the new “convert” It had made. Sometime after 3.00pm the band “Not Made in China” began to play – the Antelope`s landlord had kindly allowed them to set-up on the decking in the pub garden. And a rather good sound they made (using the amps & p.a. equipment provided by the band #Hashtag who played some good tunes after them). 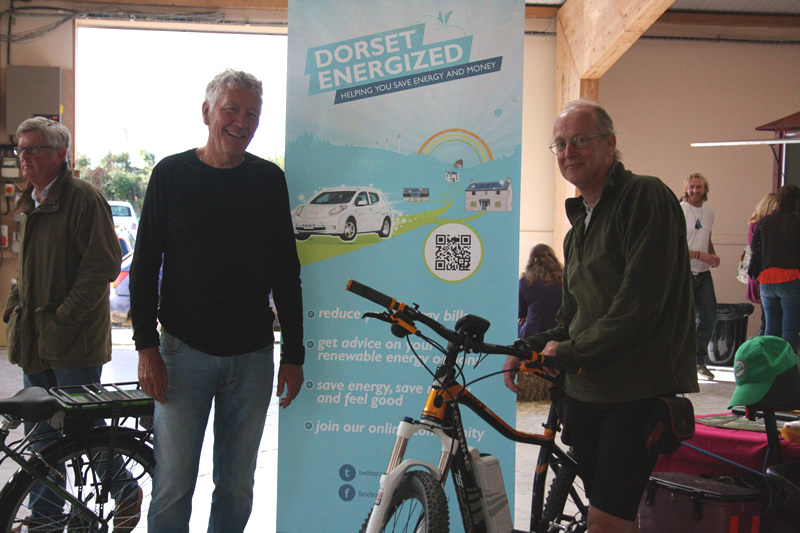 After their set several of the “Not Made in China`s” took an interest in the Batribike (electric bike) that the Dorset Ebike Centre had lent. Initially a bit sceptical – as people so often are – one then another took the Batribike out for a circuit. Once the ground began to rise and the motor was engaged – light dawned and the point of the electric was realised & fun was had. 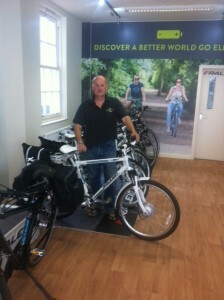 That`s the way it is with ebikes – once tried, most people realise why we ride electrified. Not everyone of course – but you have to try one (or two, or . . . . ) to really know. The upshot is one of “Not Made in China” quite possibly asking me to fit an ebike kit to his bike and another quite seriously thinking of buying a ready made one – and maybe more to follow (though not necessarily from the band). So from an Ebike point of view the day went well – but also the two supported charities Help for Heroes, & Canine Partners (who were well represented on the day) hopefully managed to raise much need funds during the event and hopefully more donations will follow (via the event website) when the cycle to Spain gets underway on the 8th June. 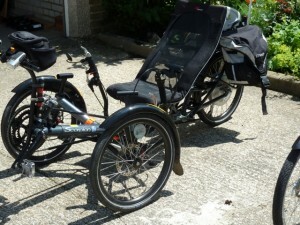 "Please contact, I have an ICE Sprint with a Mojo fitted by Tony Castles, photos available, plus two other trikes with Bionx fittings, I live in Wareham and am an amputee. John Thraves. "